손상된 Inbox.dbx 파일을 복구하는 방법? DBX is a database file of MS Outlook Express (OE), and it stores all your mailboxes or important OE elements like emails, attachments, journals, contacts and more. All these Outlook Express attributes have their own file name with an extension .dbx i.e., Inbox.dbx, drafts.dbx, sent.dbx, and so on. Among all these, Inbox.dbx is an essential file as it contains all incoming mails including your personal and sensitive info such as passwords, credit card records, etc. So, what if this file gets corrupted due to some known or unexpected conditions? How can you repair corrupt Inbox.dbx file? Which tool would you prefer to perform corrupt Inbox.dbx file repair process? What are the reasons for damaged Inbox.dbx file? The Inbox.dbx file will have a maximum size limit, and if it gets exceeded, then possibility you may lose emails from it, or the DBX file gets corrupted and you may lose access to it. So, storing mails in Inbox.dbx file even after it reaches to its maximum size limit can damaged the file. While transferring or moving Inbox.dbx file from one system to another, if any sort of interruption occur such as power surge, sudden shutdown of system, computer reboot, etc. then DBX file may get damaged and becomes unreachable which in turn leads to loss of info from it. If Inbox.dbx file gets affected by external threats like virus, spywares, malwares, etc., then the file structure may get corrupted due to which, you will not be able to open or access your Inbox.dbx file. Also, using an unreliable third party app to compress or do other task can leads to Inbox.dbx file corruption. The OE Inbox.dbx file may also get damaged and becomes unresponsive due to more reasons like header corruption, damaged storage media, abrupt termination of OE program, bad sectors, OS re-installation, software conflicts, improper upgradation of OE program and more. These are the common causes for corrupt Inbox.dbx file, and if you have ever come across these scenarios, then do not panic!! Because, with the help of Remo Recover Outlook Express (DBX) program, you will definitely come to know how to repair corrupted Inbox.dbx file within a short span of time. Why to use this software? Remo Recover Outlook Express (DBX) is the most powerful and highly ranked tool in the market to fix a severely corrupted DBX file. This incredible utility is capable to fix a large sized Inbox.dbx file. It has ability to repair a .dbx file created on different versions of Outlook Express app such as MS OE 5, 5.5, 4 and 6. Remo Recover Outlook Express tool also facilitates you to fix a damaged DBX file on all popular versions of Windows operating system such as Windows Vista, Windows 8, Windows 7, Windows XP, Windows Server 2008 and 2003. The easy to use interface of this advanced utility helps users to effectively repair damaged Outlook express Inbox.dbx file in few simple 스텝s. Other than Inbox.dbx, it also facilitates you to fix other Outlook Express elements such sent.dbx, drafts.dbx, etc. It is the best DBX repair and OE email recovery application compared to other available utilities. This application also allows you to restore missing or erased emails. 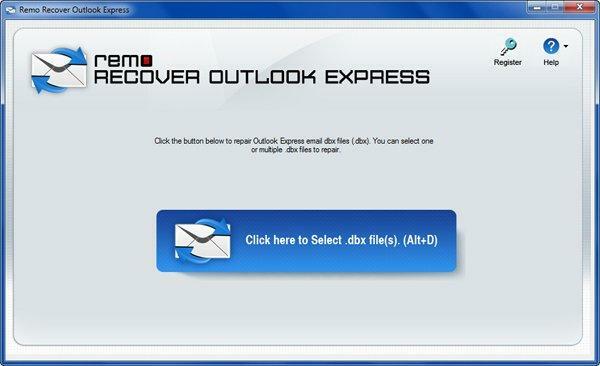 After the Inbox.dbx file repair process, the recovered emails (.eml) can be easily import back Outlook Express folder. 스텝 1: Download and install the Remo Recover Outlook Express app on your Windows system. Then, run the tool and specify the Inbox.dbx file that needs to be repaired. 스텝 2: Next, specify the destination path to store your fixed Inbox.dbx file, set the compression level if required and then click on "Ok" button to complete the DBX repair process.